​At Fort Kent, the Tigers played a Class C Quarterfinal game against the Warriors of Fort Kent. The Tigers lost 9-2. For Dexter, Nathan Richards and Kobe Pillsbury scored one each. ​At Dexter, the Tigers played a Class C Prelim game against the visiting Blue Devils of Calais, the Tigers won by a score of 5-1. For Dexter, Nathan Richards had one goal and one assist, Kobe Pillsbury had two goals, and Ethan Boutilier scored one. For Calais, David Collins scored their only goal. At Dexter, the Tigers played the Pirates of Guilford and won by the score of 2-1 in a battle from start to finish. For Dexter, Nathan Richards scored one, Kobe Pillsbury scored to other. For Guilford, Eben Cooley scored one. Dexter Goalie, Brett Kusnierz had three saves. Guilford Goalie, Matt Robinson had two saves. At Searsport, the Tigers score four goals in the second half to beat the Searsport Vikings 5-2. For Dexter, Nathan Richards scored two goals, Trever Richards also scored two goals, and Ethan Boutilier chipped in with one. For Searsport, Charlie Spiegel and Shawn Dakin each scored once. At Orono, the Red Riots score four goals early into the second half to beat the Tigers 4-0. For Dexter, the Tigers were shutout. For Orono, Samuel Henderson scored two, Trent Lick scored one, Patrick Tyne scored once. Dexter Goalie, JJ Devine had twenty five saves on thirty shots. Orono Goalie, Javier Santiago had zero saves on two shots. At Dexter, the Tigers had four different scorers to beat Searsport 5-0. For Dexter, Nathan Richards scored two goals, Kobe Pillsbury, Ethan Boutilier, and Seth Robbins each had one goal. Kobe Pillsbury and Ethan Boutilier each had an assist. Dexter Goalie, John Devine had five saves. Searsport Goalie, George Dakin had two saves. At Dexter, the Tigers allowed six goals to lose against the Red Devils of Central by the score of 6-1. The Tigers are now 3-7 and Central improves to 9-2-1. For Dexter, J.J. Devine scored the only goal for the Tigers, Trever Richards assisted on that goal. For Central, Yosef Worcestor scored two goals, Noah Kepple, Alfie Griffin, Alex Hewitt, and Cameron Doak each scored one. Dexter Goalie, Brett Kusnierz had fourteen saves on twenty two shots. Central Goalie, Bryce Burns had eight saves on twelve shots. At Dexter, the Ponies of Foxcroft Academy defeated the home Tigers by the score of 7-4. Fore Dexter, JJ Devine had a hat trick, Nathan Richards scored one, Ethan Boutilier had one assist. For Foxcroft, David Chen, Jacob Raines, Shadane Hamilton, Hieu Bui scored twice, Bradley Whitten also scored twice, Cody Tetlow had 3 assists. Foxcroft Goalie, Lucas Ames had three saves. At Milo, the Tigers lost to the Patriots of Milo by a score of 4-3. The Tigers are now 3-5 and Milo improves to 3-6. For Dexter, Nathan Richards had one goal to go along with one assist, Ethan Boutilier had one goal, JJ Devine had one goal and two assists. For Penquis, Derek Pierson had two goals, Camron Bailey had one goal, Zac Mills had the winning goal. Penquis Goalie, Camron Bailey and Grady Atkinson had four saves on eight shots. The Tigers will play on Monday the first of October against the Foxcroft Ponies. ​At Corinth, the Tigers played the Red Devils of Central on their homecoming Saturday. The Tigers lost by a score of 2-0. The tigers are now 3-4 and Central is 5-2-1. For Central, Alfie Griffin scored a first half goal, Yosef Worcester followed up with a second half goal. Dexter Goalie, Brett Kusnierz had twelve saves on nineteen shots. Central Goalie, Gage Poulin had eight saves on twelve shots. At Dexter, the Tigers could not keep up with the Red Riots of Orono and lose by the score of 10-1. For Dexter, Ethan Boutilier scored one goal. For Orono, Trent Lick had four goals, Sam Henderson, Jackson Campbell, Pat Tyne each had one goal, and Noam Osher scored two. Dexter Goalie, Brett Kusnierz had seventeen saves. Orono Goalies, Javier Alicia-Santiago and Chris Cost-Kilpatrick had zero saves. At Bucksport, the Tigers had five different scores to knock of the Golden Bucks of Bucksport High School. For Dexter, Nathan Richards scored two goals and two assists, JJ Devine two goals and one assist, Ethan Boutilier also had two goals and one assist, Trever Richards and Seth Robbins each added one goal. For Bucksport, Jakob Donnell one goal, and Gabriel Stegner had the other goal. Dexter goalie, Brett Kusnierz had nine saves on thirteen shots. Bucksport goalie, Worcester had four saves on sixteen shots. At Foxcroft, the Tigers could not come back from a late second half goal to lose 3-2 against the Foxcroft Ponies. For Dexter, Nathan Richards scored the tigers two goals. For Foxcroft, Cody Tetlow had one goal for the Ponies, and Michael Wang scored two goals. At Guilford, the Tigers scored in the first 90 seconds into the game and never looked back. The Tigers went on to win 9-0 with 3 players scoring hat tricks. For Dexter, John Devine scored three goals and three assists, Trever Richards also scored three goals and assisted on three more, Nathan Richards put in three more. Kobe Pillsbury, Brett Kusnierz, and Alex Smith each had one assist. Dexter Goalie, Brett Kusnierz had four saves on six shots. Guilford Goalie, Caleb Willis had nine saves on twenty shots. At Dexter, the Tigers faced the Patriots of Milo in a class C men’s soccer game. The Tigers won by a score of 7-1. Dexter rallied behind Nathan Richards 3 goals in the first half. For 1-1 Dexter, Nathan Richards scored five goals, J.J. Devine scored once, and Ethan Boutilier also had one goal. For 0-2 Penquis, Cameron Bailey scored the Patriots only goal of the game. ​At Dexter, the host Tigers fell short as the Eagles of George Stevens Academy scored three unanswered goals in the first half to beat the host Tigers 6-3. Nathan Richards scored two goals, and John Devine scored one goal and had one assist, Chris Roderka assisted on one goal. Owen Vinall had one goal, Ethan Vinall scored once, David Gatsby scored twice, Ricardo Sanches contributed with one goal, and Mike Moon put one in the back of the net. Tigers Goalie Brett Kusnierz had twenty four saves. ​GSA Goalies Jed Sawyer and Liam Webb combined for fifteen saves. Dexter Boys Soccer hosts Houlton High School for the Quarterfinal match-up between the 4 and the 5 seeds. Keegan Gentle of Houlton would score on a PK 10 minutes into the game. Gentle would then score again 7 minutes after assisted by Pat Howe. Bud Sathtachotinun scored with 14 minutes left in the half. Matt Richards would later score off a header from Bud’s free kick. Nolan Porter would then later score the game-winning goal with 4 minutes remaining to lift Houlton to win. Brett Kusnierz made 5 saves on 9 shots for the Tigers. A.J. Henderson made 6 saves on 13 shots for the Shinertowners. The Men’s Soccer team would have their final regular season game in Guilford to face the PCHS Pirates. The Tigers lose 5-1. Dylan Drew had 5 goals for Guilford. Cameron Kane, Eben Cooley and Bryce Gilbert would all have assists. Bud Sathtachotinun would have the lone goal for the Tigers. Brett Kusnierz had 12 saves on 28 shots for Dexter. Sean Kimball made 9 saves on 14 shots for Guilford. 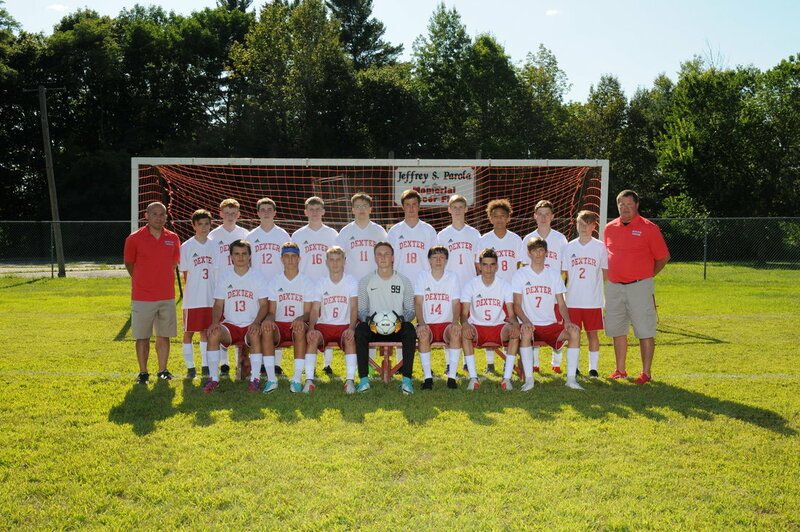 The Men’s Soccer team would travel to Searsport to face off against the Vikings. The Tigers would take a 1-0 lead in the first half from a goal by Matt Richards who was assisted by Nathan Richards. The Tigers would then score two more times in the second half one by Matt Richards again and one by Nathan Richards. Boy’s Soccer would host the undefeated Red Riots of Orono. The Tigers would hold the game scoreless in the first half but, would break it open 20 minutes into the second half off an assist by Matt Richards to his brother Nathan Richards to put the Tigers up 1-0. The Tigers would hold off to give Orono their first loss of the season. Brett Kusnierz would have 8 saves on 14 shots for Dexter. Nathan Reid for Orono had 2 saves on 11 shots. Dexter Men’s Soccer hosts the Central Red Devils for their homecoming. The Tigers score early and would hold up to beat the Red Devils 4-2. Bud Sathtachotinun lead Dexter with 2 goals including a penalty kick and had an assist. Nathan Richards scored 13 minutes in to start the game off. Matt Richards would then add a goal for the Tigers. Micah Ward of Central scored a 28 yard free kick and Alfie Griffin also added a goal for the Red Devils. Brett Kusnierz for Dexter had 7 saves on 10 shots. Gage Poulin had 10 saves on 18 shots for Central. Dexter’s Men’s Soccer heads to Dover-Foxcroft to go up against the Foxcroft Academy Ponies. Dover came out on top winning 3-2. Shadane Hamilton, Jacob Olsen and Cody Tetlow had goals for Dover. Matt Richards for Dexter had the 2 goals. Brett Kusnierz had 12 saves on 32 shots for the Tigers. Lucas Ames made 5 saves on 7 shots for the Ponies. Men’s Soccer hosts Penquis High School. Dexter comes out strong and finishes strong to a 6-1 win. Matt Richards leads the Tigers with 3 goals and 2 assists. Nathan Richards, Trever Richards and Alex Aguila all recorded goals for the Tigers. Bud Sathachotinun had 2 assists and George Lewis also recorded an assist. Zakary Mills scored the lone goal for Penquis. Men’s Soccer 3-3-1 has a home game against Searsport Vikings. The game ended in a 1-1 tie through 2 overtimes. Christopher Roderka scored late in the second half off an assist off Matt Richards. Shawn Dakin a few minutes later equalized the game 1-1. Brett Kusnierz had 4 saves on 9 shots for the Tigers. Ben Powell had 13 saves on 23 shots. Men’s Soccer heads to Central for their homecoming game. The Red Devils win 3-2. Yosef Worster scored 3 first half goals to lead the Red Devils over the Tigers. Bud scored and assisted Matt Richards. Tiger’s Goalie Brett Kusnierz had 7 saves on 13 shots. Men’s Soccer heads to Orono High School to face off against the Red Riots. The Tigers lose 6-1. Calvin Murphy had 1 goal and 2 assists to pace Orono by Dexter. Tomas Yepes, Joseph Astumian, Ben Allan-Rahill, Ben Amar, and Sam Henderson each had a goal for the Red Riots. Nathan Richards had the lone goal for the Tigers. Hon Sun-Jan saved all 10 shots for the Red Riots. Brett Kusneirz had 18 saves on 35 shots for the Tigers. Men’s soccer goes on the road to face Penquis Valley High School. The Tigers go ahead early and continue on to victory winning 4-0. Matt Richards recorded 3 goals and Trever Richards scored to push the Tigers ahead to victory. Men’s Soccer 1-1-1 goes to Bucksport to face off against Golden Bucks 2-1. The Tigers finish the game with a bang winning 7-5. Nathan Richards scored 4 goals, Trever Richards scored 1, Bud scored 2. Matt Richards had 2 assists, along with Christopher Roderka who also had 2. The Men’s soccer team 1-0-1 is set to face off against Dover-Foxcroft Ponies 1-2. The Tigers went up 2-1 at halftime but Foxcroft battled back and took the game 3-2. Matt Richards and Nathan Richards both recorded goals for the Tigers. Alex Atkinson, Cody Tetlow and Simison Wanimbo all recorded goals for the Ponies. Matt Richards had an assist. Jacob Olsen had an assist for the Ponies. The Tigers are 1-1-1 going into Bucksport. Tigers Goalie Brett Kusneirz 10 saves on 29 shots. Foxcroft Goalie Lucas Ames had 13 saves on 15 shots. The Dexter Tigers Men’s Soccer 0-0-1 faced off against the Guilford Pirates 2-0. The Tigers came back with a win after being down 6-3 late in the game. Matt Richards recorded 5 goals with the game tying and the game winning goal. Nathan Richards scored the other 2 goals. For Guilford Dylan Drew and Cameron Kane both had goals, while Bryce Gilbert, and Kobe Gilbert had 1. Matt Richards had 2 assists. Brett Kudneirz and Matt Hanscome combined 15 saves on 24 shots. The Dexter Tigers Men’s Soccer starts their season off with a home game against George Stevens Academy. The Tiger’s finished with a 3-3 tie. Matt Richards recorded a hat trick against George Stevens. Trever Richards recorded an assist during that game. Owen Vindall scored 2 goals and Mike Moon scored the final goal to make it 3-3. Brett Kusneirz from Dexter had 8 saves on 13 shots. Alec Witham from GSA had 6 saves on 18 shots. ​At Dexter, the Tigers faced the Patriots of Milo in a class C men’s soccer game. The Tigers won by a score of 7-1. Dexter rallied behind Nathan Richards 3 goals in the first half. For 1-1 Dexter, Nathan Richards scored 5 goals, J.J. Devine scored once, and Ethan Boutilier also had 1 goal. On the 2nd of September Guilford came to Dexter. Dillon Drew scored the first goal. The Tigers came back and tied the game in the second half when Matt Richards scored. The Pirates scored the winning overtime goal. On nine shots goalie Tyler Phebus had four saves. Goalie Joshua Simcock had six saves on nine shots. On the 6th of September Dexter traveled to Central. Central had six different scorers. Andrew Speed, Caleb Shaw, and Yosef Worster combined for 7 goals and 4 assists. Zak Bailey, Alfie Griffin and Cody Raymond all had one goal Seth Hathaway and Gage Poulin made 4 combined saves on four shots. Matt Richards had 18 saves on 30 shots. On the 8th of September Milo came to Dexter. In the first half Ethan Boutilier assisted Nate Richards on the first goal of the game. Matt Richards and Matt Hanscome had four combined saves on eight shots. Dereck Thomas scored the game winner for the Penquis Patriots. Cameron Bailey had two saves on four shots. On the 12th of September Dexter traveled to Foxcroft Academy. Chandler Rockwell had 3 goals and Logan Butera scored 2 as the Ponies roll over the Dexter Tigers. Riley Poisson and Sam Harmon-Weeks also scored. On four shots Andrew Miles blocked three. Out of forty shots Matthew Hanscome had twenty saves. On the 15th of September GSA came to Dexter. Sam Scheff, Taylor Schildroth, Cameron Gordon, and Walker Ellsworth all scored once. John Larson and Payson Allen both scored twice. Dexter’s only goal was scored by Matt Richards. George Clapp and Alec Witham Had a combined three saves on five shots. Dexter goalie Matt Hanscome had 15 saves on 27 shots. On the 20th of September Searsport came to Dexter. Barrett Grant scored 3 goals. Connor Kneeland and Liam MacMillan also scored. Ethan Boutilier had a hat trick and scored the first goal of the game. Even though Dexter had a great day offensively Searsport still scored three goals in the second half. On the 22nd of September Dexter traveled to Milo. Noah Zambrano and Dereck Thomas each scored two goals. Colin Beckett and Cameron Bailey had one goal a piece. On 26 shots Justin Valvo had 10 saves. Matt Richards had the only Dexter goal and Matt Hanscome had 15 saves on 23 shots. On the 27th of September Dexter traveled to Orono. Jacob Fandel had four goals and Trent Lick had two. Ben Allan-Rahill, Adam Vasquez, Joseph Astumian, Joe Sheppard and Kevan Kenefic all scored one goal to propel Orono to a 11-0 win. Cam Tower had 8 saves. Matt Hanscome had 10 saves. On the 29th of September the tigers traveled to Guilford. Matt Richards, Ethan Boutilier, and George Lewis all scored to seal the win. Matt Hanscome had 16 saves on 20 shots. Damyan True scored the only goal for Piscataquis. Sean Kimball had 11 saves on 17 shots. On the 1st of October Foxcroft Academy came to Dexter. Matt Richards had a hat trick and Ethan Boutilier also added a goal. Matt Hanscome had 9 saves on 19 shots. Chandler Rockwell’s last goal came in the second overtime to win the game. Chandler Rockwell had three goals and Ryan Cary had two goals. On 9 shots Andrew Miles had 3 saves. On the 6th of October the central Blue Devils came to Dexter. Matt Richards scored two goals.On 30 shots Matt Hanscome had 10 saves. Combined Gage Poulin, Dawson Byers, Micah Ward had 2 saves on 4 shots. On the 11th of October the Orono Red Riots came to Dexter. Trent Lick scored three goals for a hat trick, Braden Selby had two goals. Calvin Murphy, Aiden Crane, Joseph Astumian, Nathan Shemwell all added goals. On twenty shots Matt Hanscome had eight saves. On the 17th of October Dexter travelled to Searsport. Barrett Grant and Connor Kneeland both had a hat trick and Jason Frazee also scored. On eight shots Ben Powell and Gabe Poulin had seven saves. Ethan Boutilier scored Dexters lone goal and Matt Hanscome had twelve saves on thirty seven shots.